← How to remove watermarks from PDF file singly or in batches? It is easy to edit pdf description such as title, keywords, author, etc. when you convert dwt to pdf by using the application VeryPDF AutoCAD to PDF Converter Command Line. You just need to set several easy options when you write the command line in MS-DOS interface. If you want to see how to do this kind of work, please download the application to your computer by clicking here at first. Then please double click the installer and follow the setup wizard to install the program. For the application is MS-DOS oriented, please open MS-DOS interface before you input the command line. Please see the following command line options. They can be used to edit pdf description when you convert dwt to pdf. There is a successfully run command line example in MS-DOS interface shown in Figure 1. If you cannot understand the command line usage, this example will be a good explanation for you. 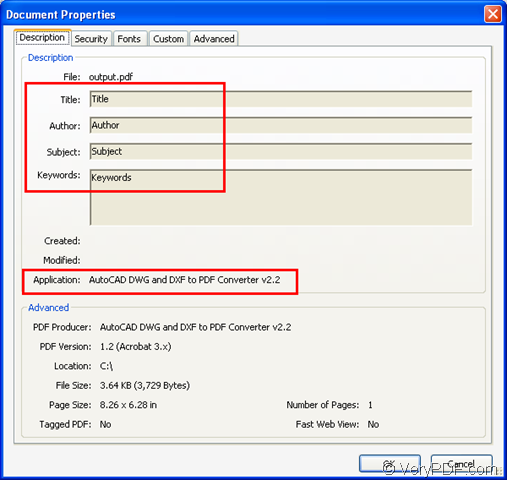 "C:\Program Files\AutoCAD DWG and DXF To PDF Converter v2.2\dwg2pdf.exe" is the path of called program. -j "Subject" is to edit pdf subject. -t "Title" is to edit pdf title. -a "Author" is to edit pdf author. -k "Keywords" is to edit pdf keywords. -i "C:\Documents and Settings\admin\Desktop\demo\dwg\demo.dwt" stands for the path of input file. -o C:\output.pdf is the path of target file. At last, please hit Enter button on the keyboard to run the conversion from dwt to pdf. You can open the created pdf document in the specified location to see its information. Please see it in Figure 2. If you still have any other questions about VeryPDF AutoCAD to PDF Converter, please bring up your questions to our support team. This entry was posted in AutoCAD to PDF Converter and tagged command line, dwt to pdf, PDF Description. Bookmark the permalink.